Last comment was posted 7 hours, 22 minutes ago. I knew with a mint-flavored Mixology Monday that others might choose the Mojito, so I decided do something a little different. 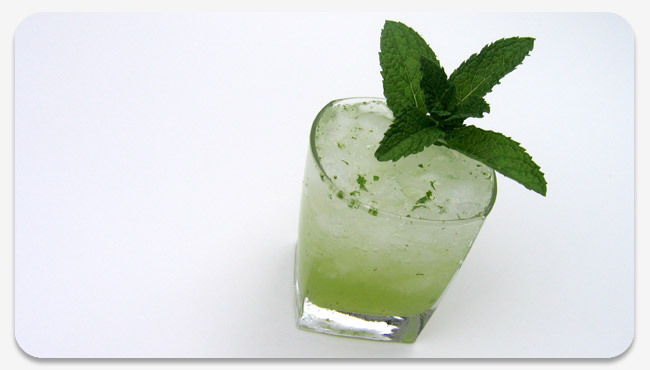 The Mojito is a very fine drink, and perfect for the approaching summer heat. But will just any recipe do? No, I’m on a quest to find the perfect recipe. And after that, I want to find the perfect rum to use in it. Let the recipe comparison begin! Muddle the lime juice and simple syrup with the mint leaves. Fill with ice, add the rum, and shake. 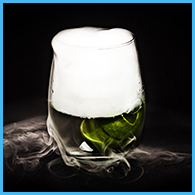 Strain into a rocks glass filled with crushed ice, top with club soda, and garnish. The mint wasn’t as forthcoming as I would have liked, and the balance of sweet to tart seemed a little off, but it was good nonetheless. Fill a 16oz glass [I used a 12oz] with ice. Build, fill with club soda, and garnish. This one tastes nothing like the first. The gold rum really makes an effect in the landscape, and the large quantity of club soda seems a bit much. Baker’s version is definitely less sweet, and I’m not sure if the bitterness of the lime peel is a good thing. Overall, not a bad drink, but not one that will be winning this recipe comparison. Muddle the sugar and mint with the lime juice. Add rum, crushed ice, fill with club soda, and garnish. Very clean and refreshing. If it was possible to be less sweet than the last one, Haigh has succeeded. The rum really doesn’t play much of a role in the drink though, and I continue to be confused with the muddling of mint leaves with sugar in liquid. You might as well slosh it around until the sugar dissolves – the mint really doesn’t get a workout, and consequently, isn’t imparting much flavor to the drink. Muddle the lime wedges with the sugar and mint leaves until the sugar is dissolved. Fill with ice, add the rum, and shake. 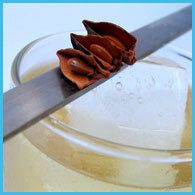 Strain into a rocks glass filled with crushed ice, and garnish. Beyond being the most fun to make, the balance of mint, lime, and sweetness was perfect. The addition of the lime wedges to the muddling allows for the mint to get smashed up quite a bit, giving it a chance to release more of its oils. This one is clearly the winner. Several of these could be consumed in a short period of time. Now, let’s turn to the rum. I have my favorite recipe, courtesy of Mr. Regan, but which rum adds the most to the Mojito? Obviously, there are more light rums out there than I was able to get my hands on, but I think I have a good base to work with. I regret not having a Havana Club or Appleton Estates white on hand. The rum managed to cut the sweetness quite a bit, and the alcohol taste is more pronounced, and not in a good way. The lime works perfectly with the Don Q… still, the balance seems a slight bit off. There is a mellowness to the Cruzan that, although tasty, somehow lessens the crispness of the drink. The balance is right, though. Very tasty. The Brugal really brings out the sweetness of the Mojito. Somehow, though, the tartness of the lime and coolness of the mint come through like shining light. This is absolutely wonderful. Which was the best rum? Post your favorite Mojito recipe in the comments, and your favorite light rum too. There are actually two key components, IMO, to the ultimate mojito: rum (natch) and guarapo (sugar cane juice). By far the best mojito I have ever enjoyed was at Cuba Libre, a venerable restaurant and rum bar in Philadelphia, PA. Other than having an irresponsible number of tasty rums on hand, they are the only joint I’ve ever been too that imports fresh, whole sugar cane, and then presses it to extract the juice, which is then used in the mojito. Goya produces guarapo in a can that you can find at Wegmans and other supermarkets with a decent ethnic section. Oh, so here’s Cuba Libre’s mojito recipe. I thought I was getting somewhere with the cute waitress when she gave it to me, but it turns out it’s posted on their website. I guess it’s unlikely that anyone can duplicate the fresh cane juice, so they aren’t too worried about losing business to the DIY crowd. One of these isn’t going to have you riding the yellow bus, but since they taste like candy, you won’t have any problem consuming them by the pitcher. just got sober this morning, then googgled for rum recipe. now that i have seen the mojito-recipe you posted. Im excited to try it tonight. Ceiba in DC does a very good traditional mojito, but my favorite is their Hemmingway. They give the ingredients but not the proportions on their web site. I’ve had lots of fun trying to find the right mix, but don’t think it’s perfect yet. The key differences are Mount Gay XO rum and Gruet sparkling in place of the soda. Yum, but extremely high octane. Tried it without the soda (notice you left it out of the instructions!?) …. w -ow! Then with the soda, a nice, cool long drink. But next time I’m gonna go without the soda… but would that then be daquiri? I’ve done that a couple of times too (forgetting the soda). It’s very good that way, but it does lose a bit of its cooling magic. I still you’re avoiding daquiri territory with all of the mint in there. I only use usually 1oz maximum of club soda; it’s just enough to give it that light fizz and happy taste. Here’s an awesome one: 2 ounces Ron Zacapa 23 yr old Rum, 1 ounce Simple Syrup, 4 slices of lime (half a lime), about 7 good sized mint leaves, and club soda. Obviously you’ll want to muddle the lime, mint, and simple syrup in order to infuse the flavors. Add ice, rum, and top off with club soda. We make about 38 different flavored mojitos at my bar and this one is by far the best! Enjoy. I’m surprised to not see a mention of Matusalem rum in there. Bacardi deserved to be #4 on that list, but Matusalem could have easily been at the top, if Havana Club isn’t available. This is by far my most favorite drink and to see not one, but 4 recipes in the one stop is like Xmas and Easter all at once. Cool – no, awesome and thanks heaps for that. Guess where I’m heading now??? fantastic… me and my wife have had the mojito as top drink for long now. today i tried the regan one and despite all the warnings i have heard of shaking a mojito this really brings out the flavour of the mint… normally i will use as much mint as possible but now i got more flavour out of the 8 leaves that i usually get from about 20! Also i used havanna club instead of the bacardi i’m never gonna use again and it really creates a whole different mojito. now i have to go and make one more!! Have to try the Brugal… I have always used Cruzan and so far, that has the best. 10 Cane is highly recommended by some, not to my taste at all (for Mojitos). I agree with the first poster, Guarapo is THE ingredient for an authentic Mojito, hard to find. If you are in NY, there is a guy in Queens on Northern blvd just west of the Grand Central that sells fresh pressed juice… I am sure you can find them in other Hispanic areas; big taste difference. Very perishable, use it right away or toss it. The mint also makes a huge difference. The mint you get in the grocery store just doesn’t cut it; there are many different types available from seed/plant catalogs that will take your Mojitos to the next level. Sorry but I don’t know the species of the one I use (VERY STRONG!) Also, muddle some lime peel (or use wedges) with the mint and add a dash of the rum to really get the oils out. With a good amount of club soda, I can drink these like water during 90 degree heat and be completely refreshed. With just a dash of club they are dangerously tasty ;) Happy Mojitos!! at my bar we are instructed to omit the soda. we make ours in custom 330ml thick tankard glasses using 3/4 of medium to small limes with the peel on. i think it is important to introduce a bit of bitter component to the drink. we then muddle with copious amounts of caster sugar(three tea spoons to be precise) because we have to sell them to the coca-cola generation people and they want sweet. we add the leaves of two-three mint springs(Mentha spicata L that is)and fill the tankard to the top with crushed ice. here comes the choice of rum- white or aged. what i do is i ask my guest if they wood like to enjoy the plain mintiness or would like to have it laced with some deep rum-warming-goodness undertones. my guest would laugh at me and usually choose the expensive option. as standard at our place you get Matusalem Bianco …or Havana 7 for 1/2 pound more which i think is reasonable.60ml rum having been poured over the ice it’s time to churn(swizzle-like) the concoction usually with the disc of the bar spoon. the movement is circular and up and down. the ice is bruising the mint and the sugar is being dissolved and incorporated in the whole. after mixing there’s so much space left as to recap with some more crushed ice and put straws and fresh mint garnish. overall not a bad drink if your ice isn’t soggy. Adam i was wondering if the guarapo is clear (not cloudy) enough to carbonise in soda siphon? that might add spark and prickle without extra dilution of flavours? !